Kayla Braxton and Vic Joseph talk about tonight’s matches. They also reveal that both members of the team that wins Mixed Match Challenge will receive the number 30 spot in this year’s Royal Rumble match. They’ll also win a trip to anywhere they want to go. Two weeks ago, Kayla Braxton asked AJ Styles and Charlotte Flair how they will win MMC. They say they are winners, and winners find a way to win. 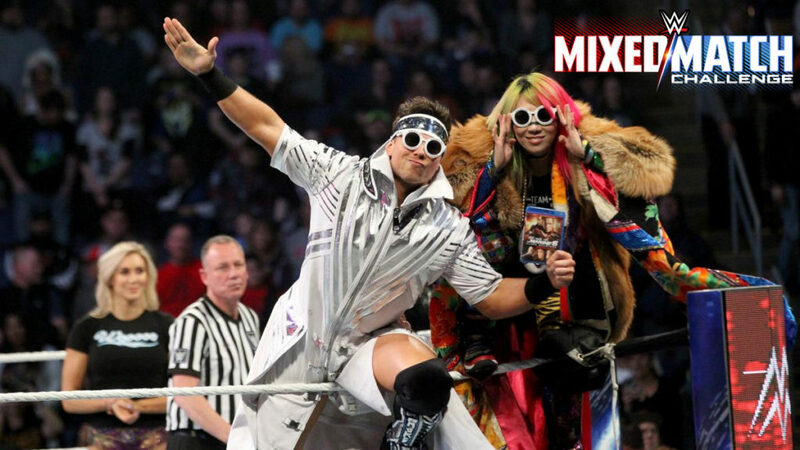 The Miz and Asuka walk up. Miz isn’t worried about facing Fenomenal Flair. Awe-Ska is undefeated, and they will continue to be undefeated. Asuka knows that Charlotte is good, but she is ready for the queen tonight. Two weeks ago, Kayla Braxton congratulated Ember Moon and Braun Strowman on another win. Moon says Monster Eclipse will not be stopped. Mickie James, Bobby Lashley, and Lio Rush walk up. Lashley says Monster Eclipse are big, but they will fall. Mickie respects Ember, but Mickie reminds everyone that she is a six-time champ. Lio Rush talks about how big and strong Lashley is. Michael Cole announces that Daniel Bryan has just defeated AJ Styles for the WWE Title while Styles is being helped out of the ring. Good match. Strowman and Lashley didn’t have a lot of time in the ring together, but Moon and James put on a good match. The shenanigans around the ring were fun too. This match did feel pretty brief though. Bobby Roode and Natalya are ready for their first win next week against Mahalicia. Alicia Fox doesn’t want to go home. Jinder Mahal says he is taking over as captain so they can get their first win. Good match. It was competitive with very little goofiness. I can’t say I approve of how the finish ended up, but I understand why they did it. Lana and Rusev won’t be going home next week. Carmella is worried about going home, but R-Truth says everyone goes home every week. This was another fun show. The matches were fine, and the addition of some rewards for the winners adds some intrigue. I’m still not entirely clear on the “playoffs” they kept talking about though. Not knowing how the tournament really works is frustrating. I liked it, though it makes me wonder who is going to get the prize (number 30 in Royal Rumble) if one of these teams who have had to change members wins.